Henri Burgers is a Senior Lecturer in Strategy and Entrepreneurship at The University of Queensland. 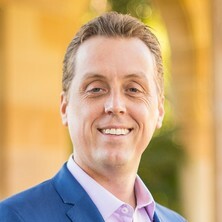 He obtained his PhD from the RSM Erasmus University, and worked at the Queensland University of Technology prior to joining UQ. His research focuses on the intersection of corporate entrepreneurship, managerial and organisational capabilities, and institutional contexts with the aim of helping individuals and organisations unlock their entrepreneurial potential. He has published in top journals such as Strategic Management Journal, Journal of Business Venturing, Long Range Planning, and the International Journal of Human Resource Management. He has worked with leading firms, industry associations and governments across the globe. His research received well over 1mln AUD in research funding, including two prestigious grants from the Australian Research Council to improve entrepreneurship and innovation in the natural resources industries. Henri teaches courses and provides workshops on strategic decision-making and agile innovation for different levels. He has developed and transformed a wide range of Bachelor and Masters courses and programs to embed more entrepreneurship and strategic decision-making skills in curricula. He is a certified Scrum Master and was awarded a Senior Fellow of the UK Higher Education Academy for his teaching. He is a recognised reviewer for numerous journals and grants and serves on the Editorial Board of Journal of Business Venturing. Fazlelahi, Forough Zarea and Burgers, J. Henri (2018). Natural imprinting and vertical integration in the extractive industries. In Gerard George and Simon J. D. Schillebeeckx (Ed. ), Managing natural resources: organizational strategy, behaviour and dynamics (pp. 138-161) Cheltenham, United Kingdom: Edward Elgar Publishing. Burgers, Henri and Glavas, Charmaine (2016, September 19). Australia has an internationalisation, not an innovation and R&D problem. The Conversation, . Can strategic entrepreneurship lead to industry growth? Moyle, Char-lee , Burgers, Henri and Moyle, Brent (2018). Can strategic entrepreneurship lead to industry growth?. In: Australian Centre for Entrepreneurship (ACE) Research Exchange Conference 2018. ACERE Conference 2018, Brisbane, QLD, Australia, (). 6-9 February 2018. Fazlelahi, Forough Zarea , Burgers, Henri and Davidsson, Per (2018). The Impact of early imprinting on the spin-off network development: a replication and extension to parent-offspring context. In: Australian Centre for Entrepreneurship (ACE) Research Exchange Conference 2018. ACERE Conference, Brisbane, QLD, Australia, (). 6-9 February 2018. Ardianti, Retno , Burgers, Henri and Steffens, Paul (2018). Transition to full-time self-employment and happiness of hybrid entrepreneurs. In: Australian Centre for Entrepreneurship (ACE) Research Exchange Conference 2018. ACERE Conference 2018, Brisbane, QLD, Australia, (). 6-9 February 2018. Perrons, Robert K., Burgers, Henri and Newton, Cameron (2018). Who are the innovators in the upstream oil & gas industry? Insights from the 2017 SPE Global innovation survey. In: SPE Annual Technical Conference and Exhibition 2018, ATCE 2018. SPE Annual Technical Conference and Exhibition 2018, ATCE 2018, Dallas, TX United States, (). 24 - 26 September 2018.